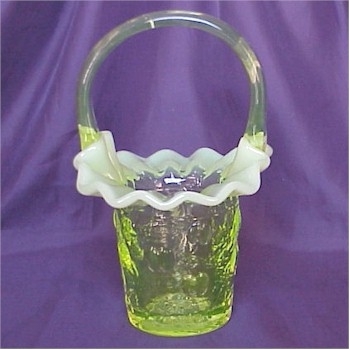 Cherry Basket in Vaseline Opal, Bargain Shack offers Boyd Glass, Mosser Glass, L.G. Wright, and Contemporary Collectible Glass including Vaseline Glass - J.B. Scottie Dogs, Pooche, Animal Covered Nests, Toothpick Holders, Salts, Glass Animal Figurines, Clowns, Dolls, Slippers, Vehicles, and More! Gibson Glass makes a very limited number of some of the most beautiful glass baskets and this Cherry Basket in Vaseline Opal is no exception. Just look at all the beautiful detail on this piece. The basket stands almost 7 inches tall and measures almost 4 inches across the top. The bottom of the basket is stamped Gibson 2005. This basket does have one tiny bit of undissolved sand crystals in the handle that you can see in the picture. Made from pure vaseline glass richly accented with opalescence this piece is sure to have a special place your collection.